Why would I need self storage in Forest Park, GA? There are a variety of reasons why you might need self-storage in Forest Park, GA.
How much is a storage unit in Forest Park, GA? The cheapest storage unit in Forest Park, GA is $40.00 per month. What size storage units do you have available in Forest Park, GA? In Forest Park, GA we have sizes that range from 3'x3' to 20'x30' to suit your storage needs. How much is it for a 3'x3' storage unit in Forest Park, GA? The cheapest 3'x3' storage unit in Forest Park, GA is $40.00 per month. Forest Park is a small city in northwestern Georgia, part of Clayton County and the greater Atlanta metropolitan area. It's a popular suburban community, especially for commuters who work in Atlanta. Since it's just nine miles from the Georgia state capital, Forest Park provides easy access to jobs, amenities and entertainment. The community now known as Forest Park was originally known as Forest Station/Astor and covered just one square mile. The earliest settlers in the area were farmers, followed shortly thereafter by many railroad employees with the arrival of the Macon and Western Railroad. It was known as a "wood and water stop," providing fuel for the trains passing through on their way to Atlanta. As the railroad industry declined, the community and its economy suffered. For many years, Forest Park struggled to find its footing as the world of transportation changed. During the early 20th century, a small passenger train continued to utilize the railroad in Forest Park, but that too was discontinued in 1931. Luckily, the city was able to evolve and adapt, emerging as a major hub of commerce. During the 1950s and 1960s, Forest Park developed rapidly, welcoming many new businesses and a rapidly-growing population. If you're considering a move to Forest Park, you'll find that this suburb is a great place to raise a family, get away from the city and still have all the amenities you're looking for. If you're considering a commute, you'll be among the many locals that make the easy drive into Atlanta or neighboring cities for work. Thanks to its proximity to the big city, Forest Park makes it easy to enjoy all the amenities of Atlanta. The Atlanta State Farmers Market is a popular destination for Forest Park locals, as is the shopping, entertainment and nightlife available nearby in the downtown Atlanta area. However, you don't have to leave Forest Park to enjoy yourself, because there are a number of opportunities for recreation and entertainment right at home. Several community parks provide a place to enjoy the warm Georgia weather, with playgrounds and sports courts for children and exercise tracks and picnic areas for adults. Starr Park is one of the city's larger parks, stretching more than 18 acres and including the city's main recreational facility. There, you can enjoy a mini-golf course, exercise room, sports fields, a swimming pool and more. The schools in Forest Park are part of the Clayton County School District. Included in the district's various programs are vocational and technical options for high school students, as well as college-level courses. You can also enroll your child in one of the city's private schools. Utilities: Georgia Power supplies the area with electricity, while natural gas is provided by several different companies. 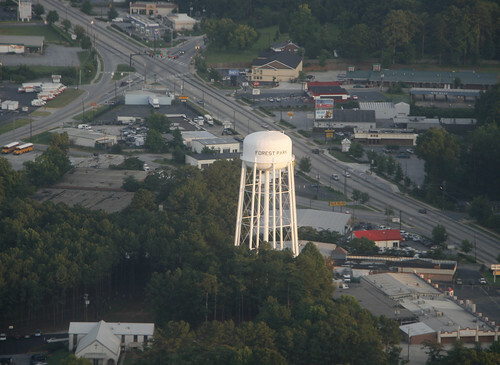 The Clayton County Water Authority administers the city's water and sewer services. Garbage and Recycling: All homes in Forest Park receive curbside collection of trash, recyclables and yard waste. Transportation: Forest Park is part of the MARTA transit network, so you'll be able to easily access Atlanta and many surrounding cities. The average home in Forest Park is significantly cheaper than the average for the rest of the state. You'll find that your budget goes much further here than in other comparable cities across the nation, which is part of the reason it's regaining attention as an excellent place to relocate. Our lowest priced units in Forest Park, GA average $44.29 per month. 558 people have reserved units in Forest Park, GA in the past 30 days. There are 7 locations within Forest Park, GA's city limits. There is 1 location in Forest Park, GA that offers AC and Heating features.